O bear market, o bear market. Where art thou bear market? While I don’t wish it upon us, I am a realist. Lurking out there somewhere is a pullback waiting to happen. I’ve been doing this long enough to know the markets do not just go straight up. Bear markets are part of investing, for better or for worse. Time has proven it. Studies show it. And when it comes, it won’t feel good. So if studies and statistics show us that a pending storm is on the horizon, and that it’s just a matter of time and severity, why aren’t most investors taking necessary precautions? It’s like seeing a hurricane headed your way. Even if it’s been awhile, don’t forget the storm can be a huge risk and not to be taken lightly. Wouldn’t you want to take steps to prepare? I would think so. 1. Rebalance/Reallocate. This is a pretty wide category, and one which most investors may be familiar with. It has to do with having a diversified mixture of investments which operate independently of each other. That’s why the recommendation to choose investments which are somewhat uncorrelated with others, leading to the saying “don’t put all your eggs in one basket”. This strategy also has to do with having bonds and alternatives in the portfolio, not just stocks. Rebalancing should be taking place regularly – but if not, now is a good time to do it. As investors get older (which is…all of us! ), they should be reassessing the amount of risk they take on. Typically, this can be done by adding more bonds at the expense of equities. It can also be done by moving from more aggressive stocks (such as technology), to more defensive utilities and staples companies. Not that these stocks will go up in bad markets, but they may lose less. Certain asset classes such as commodities and gold tend to do better relative to stocks in down markets, so one may consider increasing some exposure there. The main point being you have control over the amount of risky investments you own. 2. Use stop losses. Another way to help put a limit on your losses is to enter stop orders on your investments. As opposed to a “sell-at-market order” which would sell an investment immediately, a stop-loss order essentially has a trigger price entered to sell if-and-only-if the investment drops to a certain level. As an example, if you wanted to limit your losses on a stock to 10% and it was currently trading at $100, you could enter a stop-loss order now to trigger at $90 if it does indeed to drop to that level at some point in the future. By thinking about it in advance, you are employing a strategy and avoiding any emotional decision later (“well it could go back up so I’ll just hold it and see….”). 3. Use options. Options can be used as a hedging strategy as well. These require special knowledge/education but when used effectively can mitigate downside risk. Using “protective puts” is one example. 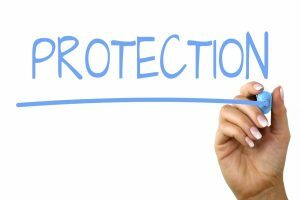 If you own shares of a stock and buy a protective put (i.e. insurance if it drops), you have the right to sell that stock at a certain price by a certain timeframe. Using “collars” or “spreads” are other more complex option strategies and I won’t attempt to explain them here. But when it comes to options, I liken these strategies to purchasing home insurance…you hope to never use home insurance sometimes you just have to pay a fraction of the price to protect your home in the event of a disaster. You effectively hedge your bet. 4. Use structured products. Investors are pouring more than $60 billion into these notes called “structured products” yet most people still have not heard about them. I use these products in all of my client portfolios. Structured products are created by large institutions (HSBC, JP Morgan, etc.) and pre-packaged for retails clients to use. A majority of them can be described as being market-linked investments tied to an index which provides some upside (potential for gains or interest) with some type of protection component on the downside. They are not without risk, but can be used as a protection mechanism and also help limit downside losses. An example would be this: a large bank such as HSBC creates a structured note that is tied to their full faith and credit (i.e. if they go under, the investment goes under…much like how a bond works). They will link the end performance of this note to an index like the S&P500, and if the index is up after a 2 year period, you get the upside. If the index is lower after 2 years, you have a certain level of protection (say -15%) on the downside. So if the index is down -16% after 2 years, you only lose 1% (since you are protected on the first 15% on the downside). As you can see, this is a way to participate in good markets, and also be protected in bad markets. Skeptics of structured products often point to their complexity and blame advisors for not taking the time to understand them fully. But when understood and explained correctly, consumers should see how they can reduce the overall risk level in a portfolio. I think they add value and also do a nice job of protecting a portfolio on the downside. Some are even Prinicpal-protected or FDIC insured! I feel confident in saying that this current bull market – one that we’ve enjoyed for the better part of 10 years – will come to an end at some point. My question to you is what are you going to do to protect yourself? I would encourage risk-averse investors to learn more about these protection strategies, or talk with someone who can help implement them.